Farmhouse Style Tiered Trays | Simply Kierste Design Co. 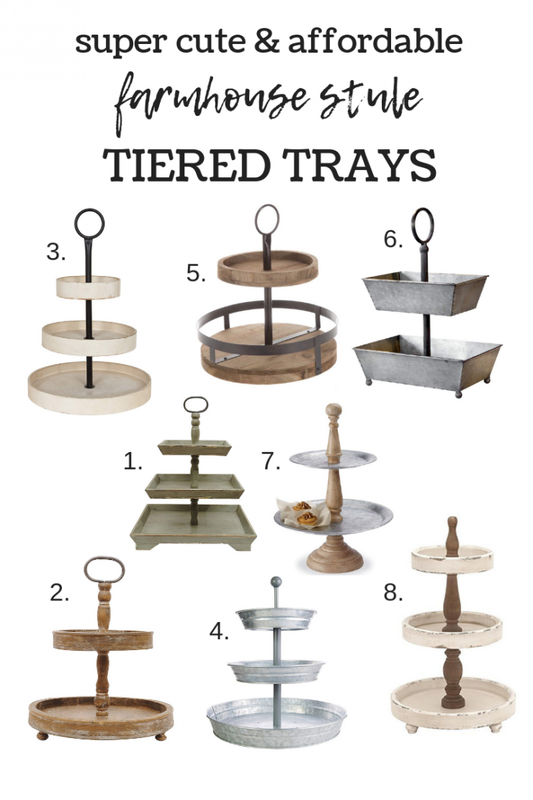 I absolutely love tiered trays…they’re perfect for farmhouse style decor, entertaining, and for functionality/storage. They add height and visual interest, and I use them all throughout my home. I’ve gathered up some super cute & affordable farmhouse style tiered trays that I found, and wanted to share them with you! And even more favorites to look through! I often get asked what my favorite or most-used decor pieces are, and although that’s a really hard question to answer, tiered trays are always at the top of my list. Right now I have a metal tiered tray full of pumpkins on my kitchen island, and it’s such a fun and easy way to decorate for fall…and all other holidays and seasons. Use them as storage in your kitchen—a hot chocolate station, jars of utensils, favorite dishes–the list goes on and on. They’re also perfect for entertaining, and whenever I’m serving guests, I have several tiered trays out for food and serving items. I LOVE them! They’re really so versatile, and they’re definitely a staple in my home. I hope you find something you love! I could not get the links to go through on the ones I liked nos. 5 and 6? Hi, Dorelle! I checked them on my end, and I was able to click through. Maybe refresh your browser, or try another one?